Cleveland's Old Brooklyn neighborhood, on the city's west side, is nestled between Brooklyn, Parma, and the industrial valley of the Cuyahoga River. The city, founded in 1814, is known for its greenhouses, turn-of-the century doubles and bungalows, and quiet tree-lined streets. It's also home to the Cleveland Metroparks Zoo, historic Riverside Cemetery, and Drew Carey's boyhood home. The Old Brooklyn area was first settled in 1814, around what is now Pearl and Broadview Roads. The area was (and still is) known for its many greenhouses along Schaaf Road, some of the first in the country to grow vegetables in such structures. According to the last census, there are 32,009 residents in Old Brooklyn. Ninety-one percent of the population is white, three percent are African-American, and six percent are Hispanic. The median household income in the city is $35,234. The majority of Old Brooklyn's housing (67 percent) consists of single family homes, the balance being two and three-family dwellings. The neighborhood's South Hills area is one of the most desirable addresses in the City of Cleveland. Old Brooklyn has several distinct shopping areas. The traditional, Post-War era shopping is located along Pearl and Broadview Roads. Newer shopping districts have developed, including the Memphis-Fulton shopping center. Among Old Brooklyn, favorites include the Honey Hut Ice Cream Shop and the Sausage Shoppe. Many distinctive churches dot the Old Brooklyn neighborhood. Some of the most interesting of these are St. Mary's Byzantine Church on State Road and Our Lady of Good Counsel on Pearl Road. Old Brooklyn includes the Cleveland Metroparks Zoo, several neighborhood parks, and the Estabrook Rec Center, which has a swimming pool, a gymnasium, a playground, and arts and crafts classes. The Treadway Creek Greenway Restoration project, completed in 2008, is part of the collection of green spaces that make up the Ohio Towpath Trail, a continuous hiking and biking trail from downtown Cleveland to the Cleveland Metroparks Zoo. 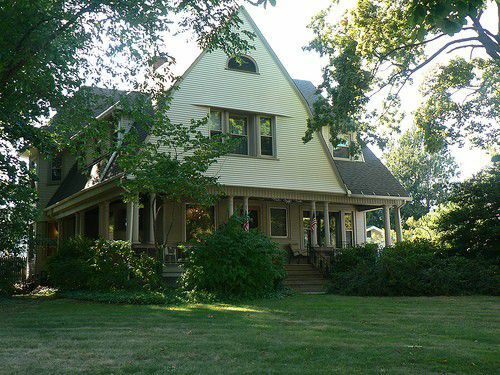 Notable residents of Old Brooklyn have included Drew Carey, 1944 Heisman Trophy winner Les Horvath, and popular Cleveland News and Plain Dealer columnist Mary Strassmeyer. Old Brooklyn residents attend Cleveland Public Schools.